This entry was posted in humor, rkba, weapon and tagged 45ACP, submachine gun. Bookmark the permalink. Hmm. So the sound of gunfire is free speech, as is the carrying of guns in public. 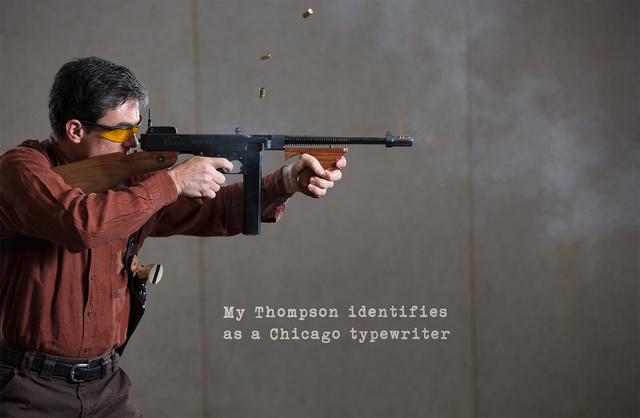 So do people still buy Thompson’s for personal defence or for historical interest? Are they still made to the original spec? They are pretty iconic. From another Volk – I’ve got an Auto Ordnance/Thompson M1SB on order. Waiting for the SN so I can process my Form 4. Looking for best prices on bulk .45 FMJ now. Nice shoulder rig, does anyone know who made it?